A one-stroke victory made for a happy Wednesday afternoon, as the Bruins edged the Griffins at Skylinks. Above: the new roundabout at 6th and Park. This, Long Beach, is a really great intersection at 6th and Park, appropriate for the neighborhood its in. It really wasn’t news for me. They’ve been doing this already—Vista and Ximeno come to mind or the failed installations of the ones that were supposed to be on Daisy at 25th, Burnett, and Hill—and it’s a really simple concept: it simultaneously slows down traffic while improving flow. Drivers, whether they know it or not, operate on a weird psychology and behavioral pattern. For one, they rely on auto behaviors that they’re so used to—this is the gas, this is the brake, this is how I speed up, this is how I slow down—that they’re not using much concentration to drive. In fact, how many people look at opposite sides of the intersection when passing a green? You don’t, right? Because it’s a green—you have the right to keep going. Drivers habitually race through lights since a green gives them a false sense of security and a yellow means they better hurry up—because heaven forbid we are stalled for 15 seconds of our lives. Stop signs, meanwhile, act more and more as “slow down” signs—particularly in our state, home of the California Roll—that equally make drivers habitually run them because “there is never anyone crossing here.” Both ultimately lead to a genuine lack of regarding one’s surroundings, not actual safety—hence the birth of the always disturbing T-bone accident. Even more, traffic engineers have discovered that few drivers actually stop at stop signs. This quick experiment found that only 6 of 21 drivers actually stop. This more formal study found that 70% of accidents at stop signs were caused by drivers, well, not stopping. When you have to make a driver focus on when to slow down (rather than when they can just “get on their way”) combined with them having to turn their steering wheel slightly like they do at a roundabout, very basic human behaviors are enacted: eye contact, communication, waves, hell, even a mouthed, “Thanks.” Because roundabouts avoid the two dangers previously mentioned: the false sense of safety (you have no green so I suggest you look at who’s around you) and rolling through something you shouldn’t (the main thrust of roundabouts are yields, not stops). Now, this is not to say that drivers using the new roundabouts, well, know how to drive. Drivers yield to other drivers on the left (because it’s a roundabout). But it’s not hard to figure out, folks. My deep support of roundabouts could very well stem from my more radical enjoyment of “naked streets” a la Hans Monderman, the traffic engineer who hated traffic lights with such a fiery passion that he eradicated them—literally. It is that precise logic which makes roundabouts work. And our deep-seated fear of letting people use their own brains often gets the best of us—and rightfully so. When it comes to expressing one’s self, well, do as you please; when it comes to our safety, we are a bit more Draconian in nature and want to (think we can) prevent everything. Think this is crazy? 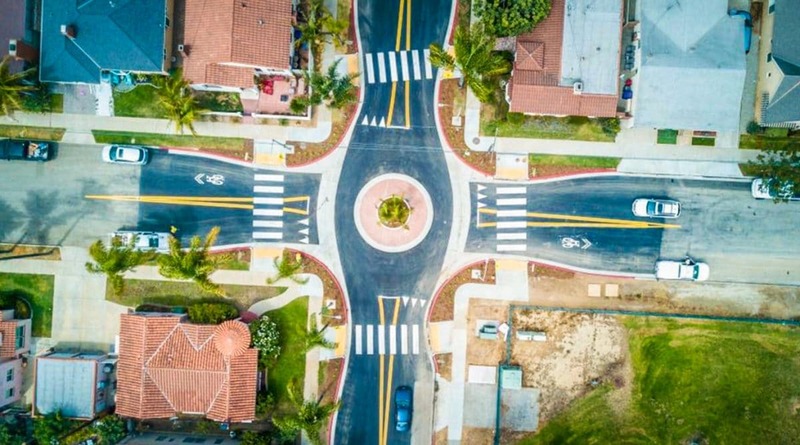 Check out Poynton, England, just northwest of Manchester, where engineers reconfigured the busiest intersection in town with two roundabouts and no lights–repeat: no lights. The three years before its creation? 17 accidents. Since its creation in 2008? Less than 10. It has prompted English traffic engineers to start removing more and more traffic signage—and, according to most, for the better. It’s not always bad, Long Beach—you just have to do a little research or reading.